Some of the most inspiring figures in history have been fictitious characters - The Common Man of R K Laxman, is one such character. He does not speak ever, is a mute spectator to all the evils, perils and hurdles in his life, impervious to suffering, a keen observant and has a supremely resilient tolerance towards his own predicament. It is well-known that art, music and musicians, theater and artistes, too, have served as arms of governance and kingdoms and often reflect, in hindsight, the quality, nature and concern towards the populace and R K Laxman served as one such artiste - an artiste that chanced to be 'available' for a certain segment of Indians to serve a certain purpose in the most opportune way - to execute a certain 'technique' that probably later became misconstrued into an 'ideology'. The Common Man, in the caricature version of the great R K Laxman, characterized and epitomized the suffering of the people of India in a manner that endeared the 'poor' in the eyes of the rich and painted or rather, 'sketched', 'poverty' to the elite in such a way that it did not leave the successful in life to feel any animosity towards either the government or those, who were not as successful or rich as themselves. Maybe, the Congress Party of today can take a hint here and mend its ways ('ideology' is a laughable term, really) that the 'poor' are not some cartoon caricatures to give support to (with 'gareebi ki ladaai hamaari ladai' - 'the fight of the poor is our fight' etc slogans) but humans, who really need help due to years of exploitation and a 'happy-go-lucky' India Inc that 'felt good' in the delightful 'Common Man' and the naivete with which he looked around him that assured them that it was not their fault if they were richer, unless the Congress Party still fools itself with 'tradition', 'dignity', 'honor' etc. 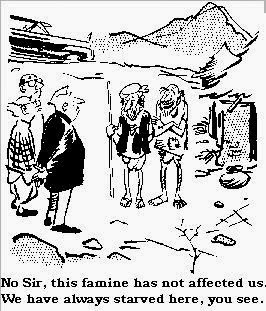 As in the below cartoon, one of many that featured in the front page of Times of India for over 5 decades. 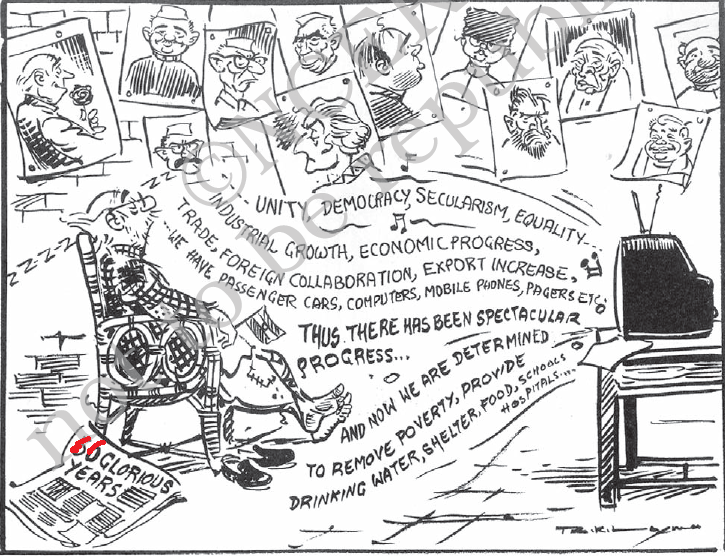 The Common Man, as depicted by R K Laxman, was not a dumb, ill-educated nincompoop but an educated person (the spectacles in India is usually indicative that a person is well-read or at least, educated), who, somehow, cannot find the words to express himself at the plight of his fellow citizens. He is not a 'puzzled', 'bewildered' man either, as many commonly describe him. The places that he finds himself in, as an onlooker, or a passer-by or simply accompanying some official puts him in a different perspective than just a 'bystander'. What could have been the last cartoon of R K Laxman. All he had to do was change the '50' years to '66' and the message would still be original. It is a legacy left behind by a simple genius that India will treasure and be guided by, forever. The works of R K Laxman with the Common Man as his chief protagonist, is an eloquence in simplicity that thousands of words could not convey, a powerful dialogue, where the 'hero' is always a silent spectator, the silence that conveyed, with a few sketches, years of governance and a dispassionate but witty commentary on public welfare. and now, with the passing away of his creator, remains betrayed yet loyal by and to a great cartoonist - R K Laxman.